Like the rest of you my mailbox has been infiltrated with magazines. Loads of them. There were a few things that stuck out for me, so I thought I’d share. So here it is, a post titled “In The Mail: Home Edition”. I like this shoe & handbag tower from Ballard. It’s a little pricey, so if you can’t splurge I’m sure you could find something similar and then just add some trim pieces from Lowes. Pottery Barn was brilliant in their recent outdoor spaces magazine. They showed tons of before and afters of porches and patios using all of their outdoor items. Brilliant.﻿ Really, it had both my husband and me needlessly looking for reasons to buy stuff (we didn’t). And you should also know that I adore these chaises. 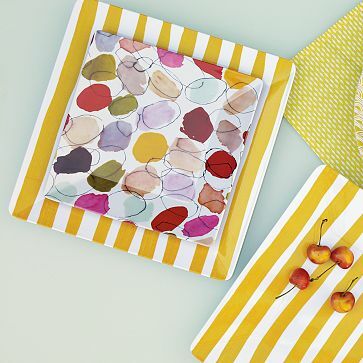 Lastly, really digging these colorful outdoor dishes from West Elm. 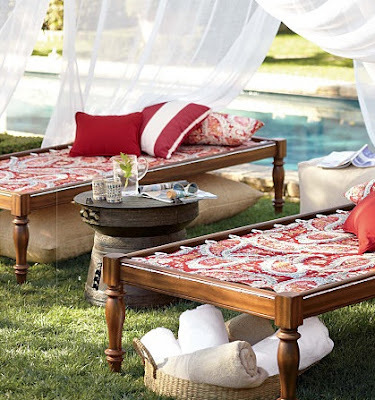 Outdoor furniture is my weakness. That pottery barn stuff is unreal! I love that shoe organizer!! Saving that pic for inspiration when I finally get a whole room I can turn into a closet! And that outdoor furniture is pretty sweet, digging the black! nice finds! Can you see where that tv screen is from? I need it for my loft:) thanks sweets! I’ve had my eye on that ballard design shoe shelf for months! It’s to die for! 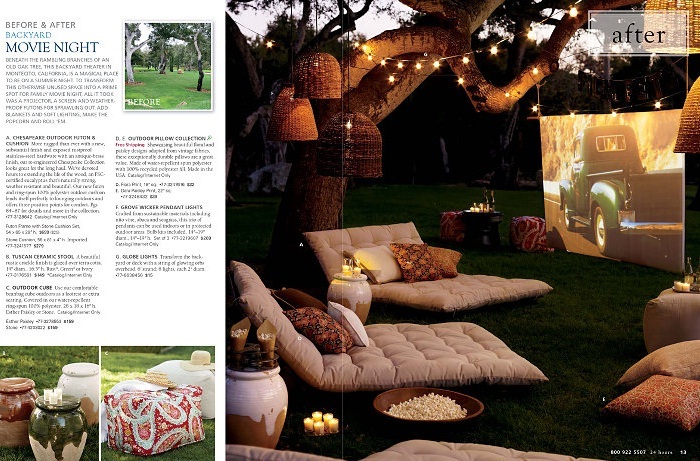 PB is so right on with their new emphasis on cozy outdoor living! I don’t recieve Pottery Barn in the mail, but now I wish I did because that outdoor space is incredible. The shoes closet is AMAZING! I love that movie theater set up! The pics are beautiful… great post! LOVING the shoe organizer! It is a must have. And the PB outdoor rooms are fabulous. OMG I am fixated on the shoe tower! I am determined to get one :) Dang you and the other thing I must buy now xoxo. Love that shoe tower from Ballard. I didn’t have room to incorporate a space like that in my new closet…but the next house for sure! I think the Billy bookcase from Ikea would be great to do it on the cheap. I NEED that shoe tower!! What great outdoor spaces transformations! I’m thinking I want to recreate that outdoor movie scene at my house for a group of friends and family! Sure love getting great mail for inspiration! I LOVE the shoe tower ! Wish I had room for it. Also really loving those chaises !! I love love the shoe tower! I have been thinking about that show organizer from Ballard for a while, but it is so expensive! I know there’s a look a like out there somewhere. Don’t you just love that “movie night” makeover from Pottery Barn? That’s my fave. 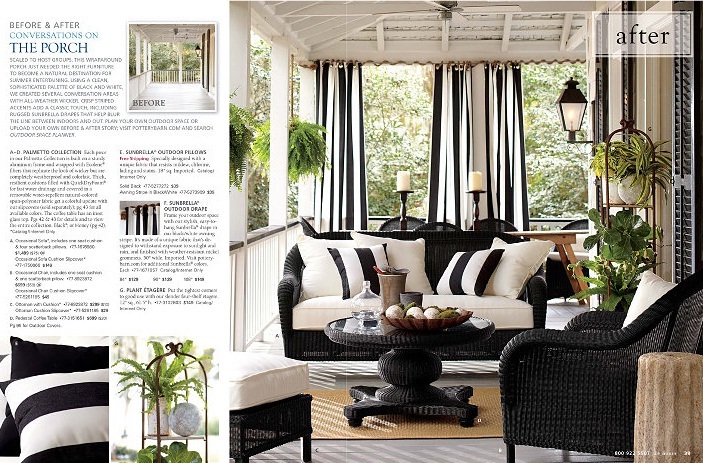 That black and white PB porch…yummy. Sometimes I get caught up in color and then I think why didn’t I just stick with black and white…it really is so neutral. Oh, that shoe tower makes me weak in the knees. I love a good outdoor space . . no matter how big or how small. I sure love that shoe tower. No room for it here, which is probably a good thing! That shoe organization piece is a dream! I was really liking the West Elm outdoor furniture too! The projector in the backyard makes me happy inside! I love getting catalogs- glad you reminded me to go look through them. Just love the shoe and handbag storage…just maybe a little space hungry though..